The Hitchcock version is one of my favourite of his films and I’ve been meaning to go back to the book, as I know Hitch was always somewhat free in his use of the original. It sounds truly compelling and dark, I’ve been reading all of the reviews you mention above and am now determined to seek it out! I was wondering if you had read the novel! Yes, do go back to it – I would love to see your take on it. The film is a classic, but I think I preferred the book. Hitchcock’s adaptation seems to accentuate the vertigo aspect, probably for increased dramatic/cinematic effect. I love the film. As you point out, it is usually well worth reading a book even if one is familiar with the movie. Sometimes I am surprised to find that classic films are actually based on books. One pitfall of reading such books is that I picture the actors from the film as the characters in the book. This is something that I had rather not do. It’s hard to avoid seeing the actors in your mind if you watch the film before reading the novel, particularly with something as iconic as a Hitchcock film! I couldn’t help but picture James Stewart and Kim Novak as I was reading this, even though Stewart plays the Scottie Ferguson role somewhat differently to my impressions of Flavières. It’s been a while since I last watched the film (I like to leave a decent gap between he two forms) so I’ll be interested to see how it stands up next time. I love these Pushkin Vertigos! I did like the Hitchcock film, but I think I’m not familiar enough with it to let that spoil my reading of this. Definitely going to be looking out for this – lovely review as always, Jacqui! They’re great aren’t they? Definitely something different from the standard mysteries we’re all fairly familiar with. I wouldn’t mind owning the complete set! This book sits well in my memory. The intervention of WWII added a nice twist. It certainly lives up to the idea the writers had of ‘a nightmare that never ends.’ I particularly liked the way that the main character has a second chance but takes a certain approach which guarantees his unhappiness. I asked myself what I would I do under the circumstances…. I have Master of the Day of Judgement too. Yes, I liked the way the two halves of the novel complemented one another. The wartime setting seems to add to the sense of displacement and anxiety in the second half of the story…and I couldn’t help but think of Anna Seghers’ novel Transit, particularly given the Marseilles setting. Did you come to any conclusions as to what you might have done had you been in Flavières’ position? The Leo Perutz sounds very intriguing, doesn’t it? I’m looking forward to that one. Pushkin books are always so beautifully produced aren’t they. I haven’t yet seen this new range but will look out for them. I think Vertigo sounds the more appealing of the two to me. Your reviews are excellent and provide everything I need to make a choice! Thank you. Well, they’ll be fairly easy to spot in a bookshop as the cover art is very striking! 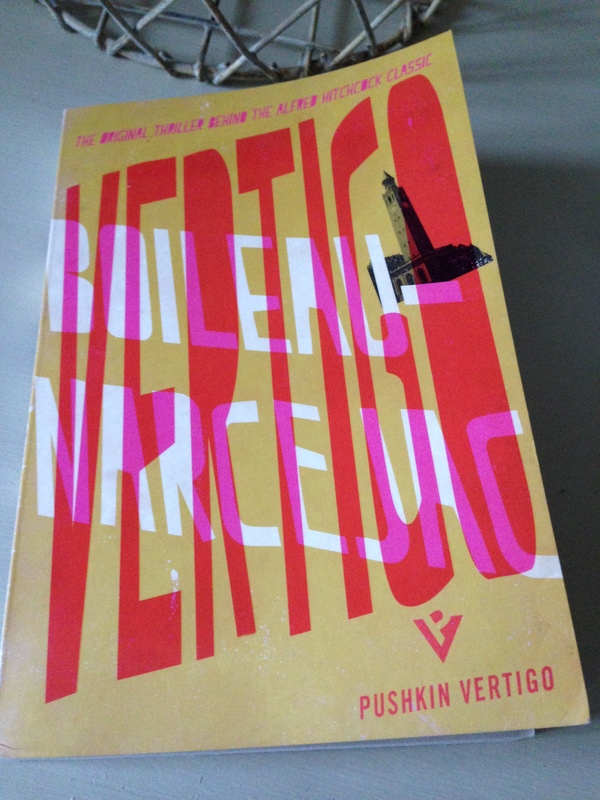 I like the whole concept of this Pushkin Vertigo imprint – it bodes well for lovers of intriguing crime fiction. If you’re at all interested in more info on Master of the Day of Judgement, there’s a review at Max’s blog (Pechorin’s Journal). Thanks for the link! Glad you enjoyed this one too – these Pushkin Vertigos are great, aren’t they? I can feel an addiction coming on. I too thought this one was darker than the film, and evn though I’m a huge fan of Hitchcock, I think in this case the book is actually better. If you haven’t read the book of Psycho, I’d thoroughly recommend it too. You’re very welcome – thanks for tempting me to take the plunge with it in the first place! And yes, I agree, in this instance the novel edges it. There’s more depth to Flavières’ character here, plus the book delves into territory that isn’t really explored in the film. Thanks for the recommendation of Psycho – I’ll definitely take a look at it. I really like the cover art, but the combination of angles and the use white type does make it rather difficult to see the author’s name. In the case of Vertigo, the overall effect is remarkably fitting for the novel – that dizzying sense of distortion fits the story perfectly! You know I saw one of the series in a book store the other day and I cannot remember what it was, I just remember thinking it was as unreadable in person as on the screen. That is the risk, to my mind, is that the author or title does not register with a browsing shopper. Good point – that is a risk with browsers, especially if they’re not particularly familiar with the titles or the authors. Maybe the cover art alone will be enough to encourage people to pick them up for a closer look? Those covers are very impactful! I am so glad you read this and thrilled that you enjoyed it! I completely agree with you – the characterization is one of the strongest parts of the novel, and your take on Flavieres is very insightful. He is grappling with a number of demons: guilt, low self-esteem, a sort of grinding resentment that can make him lash out. And yet we’re aware too how much he longs to rise out of this particular murky mindset and find something real and beautiful to live for. Perhaps that’s the key to his character – he needs the adorable Other to balance out his own emptiness and despair; alone he feels too incomplete. As you can see, Jacqui, your reading has sparked off lots of thoughts for me! Excellent review as always. Oh and I loved that Leo Perutz, too. Your review was brilliant, Victoria, and I especially liked your analysis of Vertigo as a Geist story! It’s such an intriguing novel, isn’t it? All those themes of obsession and possession running through the narrative…I think I preferred it to Hitch’s film (although it’s been a while since I last saw it, so a rewatch is long overdue). I love Pushkin and I love crime fiction so I definitely want to try these! I’ve had this book for a few years now but was always a little dubious about whether it only had a reputation because of the film. You’ve pushed it well up the pecking order..
Ooh, great. I’ll be interested to hear what you think of the book. I do like the film, but the novel gave me a better insight into Flavières’ character (Scotty Ferguson in the screen version). I also liked the way the two halves of the novel complimented one another. It’s a good one if you’re in the mood for something with a psychological edge. I’m catching up on posts starting from the bottom of the in-box, so here I am! I’ve read several reviews of this after it was published in English. I really need to get a French copy. Thank you for taking the time to drop by! I really enjoyed this one, Emma, and I think there’s a good chance that you’ll like it too. There’s a very interesting contrast between the two halves of the novel.